BOOK YOUR LAKE MANATEE TRIP NOW! You pass DeSoto Memorial Speedway, home of the Snowbird Nationals, on your way to Lake Manatee. The drag strip, located in Manatee County near Bradenton, Fla., is home of testosterone and high speed. But when you get to Lake Manatee, it’s time to slow down. Way down. The slower you fish, the better you’ll do on Lake Manatee. The key to success on Lake Manatee and many of Florida’s freshwater lakes and streams is to slow things down, especially in the summer months. And when you think you’re really fishing slow, then you need to slow it down some more. The destination on Lake Manatee is a point just beyond the first island in the lake. You can catch hand-sized bluegill on your first cast. If your a fly fishing angler, we use a No. 10 chartreuse popping bug on a 4-weight rod in some conditions. A 7 ½-foot leader with a 7X tippet. We concentrated on that areas for the first hour, not moving more than 50 feet. The end result will be worth it, ¾ of a pound to a pound bluegill. Lake Manatee can be fished with a power boat. Again, most fish far too quickly. You shouldn't be on the trolling motor continuously, but more of a drift. If you don’t hit your target on your first cast, then hit it over and over again. If you can't then your fishing to fast. We pull up to a likely spot and fish it slowly and completely. If there’s a pocket in the vegetation, we might make a dozen casts before moving pass it. We hit every opening along the way, it's just that kind of lake. We find when you fish slow, you fish thoroughly. You don’t miss many spots. You cover your area completely, that’s the wonderful thing about fishing slow. They allow you to fish very slowly. And they’re very stealthy. Lake Manatee is a tough nut to crack. There are those who fish the lake for the first time and never return. The reason is they catch few fish and can’t figure the pattern. 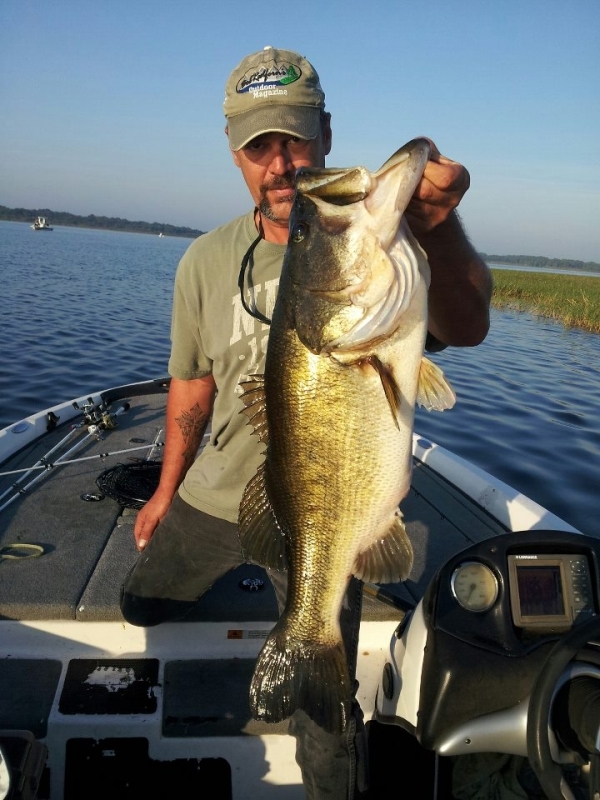 Florida anglers are shoreline anglers, or better known a bank pounders. That doesn’t mean they fish from land, it means most cast toward the shoreline vegetation. That’s a very good strategy in most Florida lakes and it works in Lake Manatee – if you know what you’re doing. You can fish some of the shoreline at Lake Manatee, but not all. Reason is that hyacinths float to the shoreline and pile up. Cast to the edge of them and there could be nothing but empty water underneath. The true shoreline might be 10 or 15 feet in back of the hyacinth jam. So, when fishing the lake, try to find areas void of hyacinth jams. It’s tough, but you can do it if you just open your eyes. When you see a tree on the shore or a fallen tree, you’re in the right area...this is where you should usually concentrate. We often make a dozen or more casts in such an area, again working slow. When you find fish, don’t leave them. Fish the area until the action stops or you catch the last fish. This park extends along three miles of the south shore of Lake Manatee, which serves as a water reservoir for Manatee and Sarasota counties. The rest of the park is primarily pine flatwoods and sand pine scrub with some depression marshes and hardwood forests. A boat ramp provides easy access to the lake; boat motors must be less than 20 horsepower. Canoeing and kayaking are very popular activities. The lake offers excellent freshwater fishing, and anglers can fish from their boats or from the park's fishing dock. Swimming is permitted in a designated area of Lake Manatee; a facility with showers is located nearby. A large picnic area is nestled in a sand pine scrub area near the lake. A picnic pavilion may be reserved for a fee. Campers can enjoy full-facility camping, just a short walk from the lake. Located 15 miles east of Bradenton on State Road 64.